Submitted by bobstothfang on Mon, 04/15/2019 - 6:12am. That's the "Discover and land on it" method. Submitted by Phaedrus on Thu, 04/18/2019 - 4:05pm. 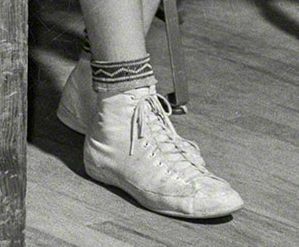 and that one young lady and better get her feet offset as well as getting a pair of white shoes! Submitted by GavinHitchins on Sun, 04/14/2019 - 8:41am. Submitted by Quisling.P.Rotog... on Sun, 04/14/2019 - 5:35am. Love the shoes on these women--especially the matching shoes on the two women on the right. They look like high-top basketball shoes! Submitted by neil49 on Sat, 04/13/2019 - 9:55pm. she's probably missed the "Me Too" boat. Submitted by Bren2411 on Sat, 04/13/2019 - 4:58pm. Submitted by Jim Page on Sun, 04/14/2019 - 2:28pm. LC Smith also made high-grade shotguns. I inherited one from my dad, a beautifully engraved double-barreled 12-gauge squirrel gun. My brother gave me a box of shells one day before I went plinking, and I didn't notice they were 12-gauge magnum loads. Of course, the old LC Smith didn't have a safety shell-length stop like modern guns, and I didn't know the difference in the power of those loads. I inserted two shells, pulled the trigger, and the darn thing just detonated on me, both barrels. I can still see in my mind's eye the lovely engraved barrel cartwheeling off into a pond and me throwing the smoking remains of the walnut stock after it. Submitted by FixIt on Sat, 04/13/2019 - 2:30pm. In my high school typing class, I was doing 40 words per minute while looking at the keyboard. The teacher kept telling me not to look at the keyboard, and my argument was I was doing 40 wpm and the goal that month was 35 wpm. He was insistent on me not looking at the keyboard and moved me next to a window. He opened it and said I was going to sit there until I stopped looking at the keyboard. It was January and about 20 degrees above zero. After about 10 minutes of the whole class complaining about the cold, he defiantly slammed the window and let me continue looking at the keys the whole semester. I got up to 55 wpm with no mistakes. To this day I still look at the keyboard and only use the middle finger and thumb of the right hand and the index finger of the left hand. And I'm one of those guys wearing shorts in January. Submitted by KathyRo on Sat, 04/13/2019 - 1:44pm. 1) I thought "bobby soxer" was a term from the 50s but no it's from the 40s. 2) The LC Smith company later became Smith Corona. 3) The Woodstock Typewriter Company was based in Woodstock, IL which was the home of another typewriter company : the Oliver Typewriter Company. That company was started by Thomas Oliver who was born in... wait for it... Woodstock, Ontario, Canada. I'm doing important work here. Submitted by Vonderbees on Sat, 04/13/2019 - 10:19am. That was our typewriter when I was growing up. Spent many hours banging on that thing. Submitted by RDown3657 on Sat, 04/13/2019 - 10:18am. Although I took typing 15 years after these lasses, it reminds me of the routines -- "asdf jkl;" How many times did I type that, along with "The quick brown fox jumps over the lazy dog." But as a guy, it was such a pleasure being surrounded by all the gals. Only one other guy in the class. And, dang, I learned how to type, too! Submitted by Ozinor on Sat, 04/13/2019 - 5:59am. Back in 1960 or so I wanted to take typing in high school, but wasn't allowed to because "Only girls can register for typing." That stupid rule caused problems for me through 50 years of work in infotech. I taught myself a six fingered technique that became so ingrained that I never could transition to normal touch typing. Submitted by Doubleclutchin on Fri, 04/12/2019 - 7:47pm. Perhaps the gent on the right harbors Vice-Presidential aspirations? Submitted by davidk on Fri, 04/12/2019 - 7:47pm. I took typing as an option (instead of Latin) in Grade 9 in 1971 and I was the only boy in the class. The teacher, Mrs. Stopchycki, treated me no different from the girls, which I really appreciated. I lay low, absorbing the wonderful atmosphere, and learned to type at 40 wpm on a portable manual (Olivetti Underwood 310), all the while having very quiet and innocent lascivious thoughts. 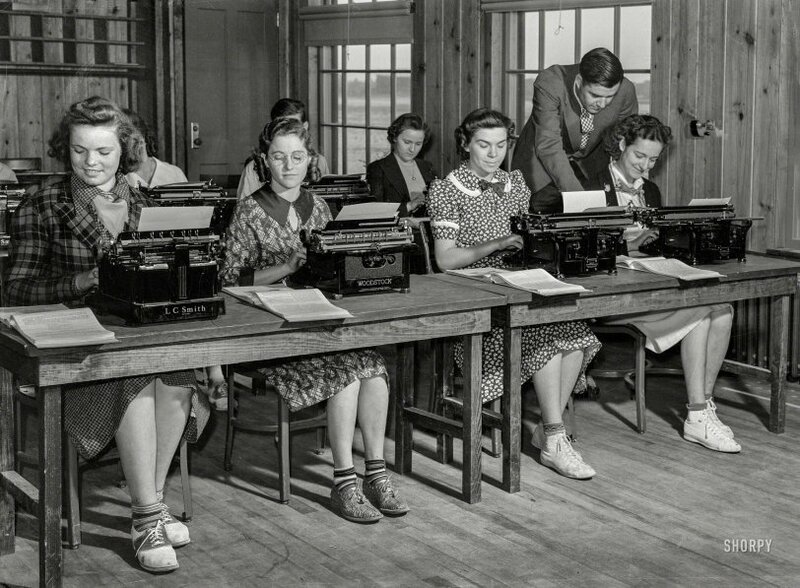 Typing class back then was like what yoga class is now: a workout, but pleasant and relaxing, in a majority-female environment. Submitted by rhhardin on Fri, 04/12/2019 - 7:14pm. That appears to be Alger Hiss's Woodstock typewriter. Submitted by JennyPennifer on Fri, 04/12/2019 - 7:11pm. I reckon the young lady on the far right is a mite pleased with the attentions of her teacher. As we say down south: Yee Yee! Submitted by Lectrogeek68 on Fri, 04/12/2019 - 6:53pm. Roxanne xeroxed sixty extra proxy indexes.